This chapter on LVM/LVM2 focuses on the use of the LVM GUI administration tool, i.e. system-config-lvm. 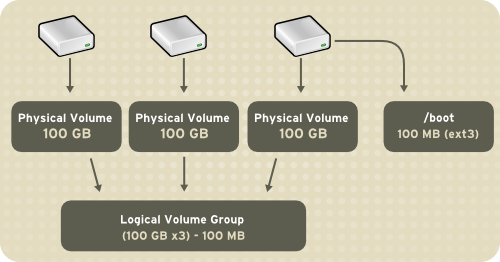 For comprehensive information on the creation and configuration of LVM partitions in clustered and non-clustered storage, refer to the Logical Volume Manager Administration guide also provided by Red Hat. In addition, the Installation Guide for Red Hat Enterprise Linux 6 also documents how to create and configure LVM logical volumes during installation. For more information, refer to the Create LVM Logical Volume section of the Installation Guide for Red Hat Enterprise Linux 6. LVM version 2, or LVM2, was the default for Red Hat Enterprise Linux 5, which uses the device mapper driver contained in the 2.6 kernel. LVM2 can be upgraded from versions of Red Hat Enterprise Linux running the 2.4 kernel.